Recently, we at MaidThis had a fantastic opportunity to chat with and interview Elizabeth K., a Dallas-based vacation rental host. 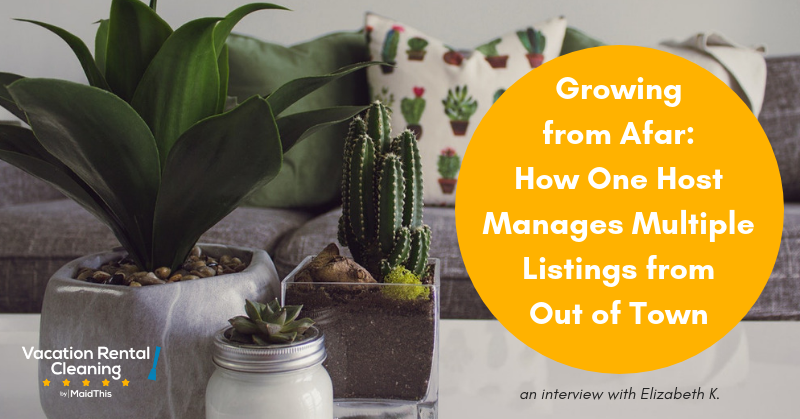 Elizabeth has built her business from just one vacation rental listing in the Dallas-Fort Worth area to 7: She’s recently expanded into remote Airbnb management with one listing in LA and the other 6 in DFW. 1) the systems she’s been implementing to help her grow and keep her business organized. 2) which services and apps she uses to help manage her listing. 3) how Elizabeth manages guest reviews. Getting to Know Elizabeth K.
MT: Well, to start us off, can you tell us a little bit about yourself and your business, and how you got started? EK: Yeah, sure. So the first time I got into Airbnb, I was living in Denver in a very cool neighborhood – LoHi – for those who are familiar with Denver… and I moved in with my boyfriend but my lease wasn’t up yet and I was kind of stuck in the lease. So I thought, well, perfect, I’ll just throw it on Airbnb. So, that was my first one [here] and then the lease was up a couple of months later, so I got another one nearby where I live. I was worried about the risk and got one that was very inexpensive. From there, I got another one in the same building and in the past seven months, I have 7 Airbnb rentals. MT: Wow! And are they all in the Dallas area, then? EK: This is how I was introduced to MaidThis! I got one in Los Angeles – in Marina del Rey. It’s an awesome location and I was so excited about it. Everyone I know was telling me it was a horrible idea, but I felt confident I could pull it off. One week was spent getting it fixed up and decorated, and the second week was going to be focused on finding the right cleaning company. And fortunately, I came across [MaidThis] and that was the biggest hurdle. I mean, I can decorate any place in no time, but obviously, in this business, a partnership with the right cleaning company is very pivotal, especially if you’re trying to scale your business. MT: Wow, that’s incredible. You’re managing multiple places locally as well as dabbling in remote Airbnb management. So you’ve done all of this since February 2018, is that right? EK: I have, yeah, And I don’t know that I would recommend that to most people. [Laughs] I think my fiance wants to shoot me half the time! I love getting them fixed up, you know, and creating homes for people and whatnot. And slowly, as I’ve been scaling, I’ve had to create operating systems or put systems in place that help. I can’t possibly reach out to all the people and handle everything. So now I’m working with Guesty and a few other great Airbnb apps that automate a lot of things, which really, it’s a lifesaver. I really don’t have to worry about the one in Los Angeles because you guys go and clean, we don’t have to talk about it, or I don’t have to worry about what I owe you. I love it. MT: So tell us how kind of how you’ve managed … Because you don’t actually own any of your locations. They’re all literally rentals that you’re renting in your name and then renting out as well on Airbnb. Have you had any issue with that as far as not being the actual owner or has it been smooth sailing for you? EK: Some days, everything goes great and other days it’s like, oh my gosh. I’ve got a lot of hoops to jump through and it’s kind of a gray area so I certainly don’t go announcing it… Like this past weekend, it was kind of crazy. I was in LA at the Marina del Rey location, and one thing after the next is going wrong, and one of my new units – somebody walked down to the leasing office and asked for a parking pass saying they were Airbnb-ing my place. So that wasn’t very exciting. So sometimes, yeah, of course, I have to deal with things like that. MT: Wow, that sounds like a lot to try and juggle! On the other handing, using Guesty specifically to help you manage all of your bookings across multiple sites has been working well? EK: Yes. And let me tell you, it’s a learning curve. I was the last person on a Blackberry and trying to get me to switch to an iPhone, it literally was very challenging. It’s learning a whole new operating system. But it’s proven to be very, very useful. I can’t tell you. The key on scaling any kind of business like this is automation. So now whenever guests check in, they automatically get an email and they think it’s coming from me because it’s very personalized. But yeah, everything kind of runs itself. Now, I don’t even know who’s checking in, checking out. Whereas before, I was constantly reaching out and there’s just no way you can do … I have so many reservations every month it would be chaotic! MT: Do you also work with any kind of outside management company that helps you keep track of your guests and correspondence and things like that? Are you able to manage it on your own? EK: No, I don’t. It’s just me and Guesty and you guys now, MaidThis, fortunately. And then I’ve got my housekeeper whom I very much consider my business partner here [in Dallas]. She’s wonderful and is the first person I call about everything. She’s the only one that gets it, you know? We can laugh about things together and cry whenever people leave it especially dirty and whatnot. It’s been … very rewarding, I guess is the right word? Is just being able to provide work for her. Not that she doesn’t already have enough clients, but now she’s been able to let go some of them, and she has her own schedule. I don’t have to keep tabs on her. She gets updates as the cleanings come in, and does her work, and I can trust that. Then she’s hired a couple of people below her, so it just makes me feel good that I’m providing employment for people. MT: What you’ve accomplished this year is really incredible! So just to confirm, you have six rentals currently in Dallas or in the Dallas area? Dallas, Fort Worth, and then just one in LA? EK: Right. One right now in LA. The whole thing, it’s kind of just been an experiment. From what I read from other companies that have done this and done a good job of it, I think it’s kind of crazy that I’ve gotten seven in the past six months. But now, we are actually, we just put our own house that we live in on there. I thought I had it blocked off for another week, but I noticed Friday morning when I woke up I was like, “Oh no, honey, we’re not gonna have to go stay at number one.” I have them all numbered because yeah, we just got like an eight or nine night booking here! It’s exciting. It’s crazy. We’re kind of like living this hobo lifestyle of having to bounce back and forth. MT: So tell us a little bit about how you decided to expand outside of your own – for lack of a better term – niche there in Dallas into a completely different state. How did you make that decision? How did you get started? That’s very unlike what most other MaidThis Airbnb hosts are doing currently. It’s a really interesting story. EK: It makes me sound like a crazy person, but I noticed this girl and she had hundreds of reviews and I thought, how on Earth? So I clicked and I saw that she had 64 listings and I was like, what on Earth? There’s no way. This cool chick from Canada, she looks, like, younger than I am. I’m like, how does she manage that? That’s when I first started really diving into the idea of expanding and I saw that she had places in Dallas. If I can pay the rent and put some money in my pocket, and it’s making a lot of money in my pocket, so yeah. I just decided to take the leap and I’m pretty excited about it. My plans moving forward, but I’m going to slow down because it’s not practical to continue at this rate. I want to get everything really dialed in, but I would like to get maybe four more in that area in LA and then yeah, maybe like Denver or Hawaii. Dream big! The more I’ve grown, lately, I’m targeting nicer places and trying to furnish them very nice and really make it fancy because for me, at least, I found that the nicer properties tend to be a little more profitable. They’re more risky, but yeah. MT: Are you purchasing all of the furniture yourself to furnish these places and the décor? Or are you renting that stuff? It’s like a constant running joke if ever stuff were to hit the fan. I have got like a warehouse-full worth of stuff. I’m gonna have so many washer dryers, PBs, air mattresses galore, sheets. Yeah, there’s a lot of stuff! LA, that was very challenging. Here, I’m like a handywoman. I’ve got a garage full of tools and I’ll buy furniture. In the beginning, I was buying nice, used furniture and then I would fix it up and make everything look pretty, but the more I’ve grown, the more that’s not practical. So I started buying stuff. LA, I really spent a lot of money. That was challenging trying to just get everything and be out there without my car and my tools and my crap. MT: So, when, officially did you start listing that rental on Airbnb or the other online listing platforms? And because you’re so far removed from LA currently, how often do you go or plan to go to see it? EK: I think I posted it in September. And you know what else I do? A little cheating tip I do is I normally post them on Airbnb or whatever. I go ahead and create the listing even like two weeks before I have the keys. So I might snap some pictures whenever I’m doing a walkthrough and things like that. Yeah, I put that one on in I think late September and it was booked the entire month, maybe. There was one weekend it wasn’t booked, and so I flew out there. That was last weekend, but it’s been booked solid since. I had one girl that booked it for over two weeks, and she really wanted to stay the entire month, but the rest of it was booked up so she couldn’t. But that one’s been great. There have been a few things, like, when I just went back out there, I had a storage thing for the garage. It actually arrived late and my first guest was already there… I’m in Dallas. and there’s a huge box out on the patio. So that was a little stressful. When I was just there, we got it set up. My fiance helped me and it took a long time, but there’s a back stock so we have extra supplies and stuff like that in LA. Here, I can run them around or whatever, but obviously, I couldn’t do that there. Over the weekend though, I have this guy coming tomorrow, and he requested bottled waters to be there. But I have a girlfriend that lives around the corner, so she went and stocked the fridge for him. EK: I don’t know yet, but we will find out within the next six months, I guess! I know a lot of people in LA, but Hawaii, for example, I’d have to go out there and get the furniture, and da, da, da. During that time, I would definitely find somebody that’s local that I trust or you know. There are those apps like Handy and I don’t know what else there is, and I’ve thought about that. But I don’t know; I prefer having a person. MT: So you mentioned that you are listed on multiple vacation rental sites. Do you find that there’s another one that you tend to get booked on often or not so much? EK: Well, thus far, the only other one that I’m on is booking.com. However, I have an onboarding lineup with Rentals United through Guesty and then through them, and get like VRBO … Home Away and all that stuff. That’s gonna be, I guess let’s call it “Phase Three.” “Phase One” was Airbnb, “Phase Two” was Booking.com. And Booking.com, each new channel, that’s a serious learning curve too and getting everything set up right. It’s been really complex. I think the more you spread out to various sites, the more hurdles you have to cross. But once you get it dialed in, I hope, I don’t know, it’s all an experiment, that everything should kind of run itself. MT: So you mentioned that part of your expansion and growth has involved a lot of systems, and we’re firm believers in systems at MaidThis What kind of systems have you set up for yourself that you feel like have been successful? Or have you had a system that you thought was going to work really well that failed? EK: I think a lot of that came into play wherever I went over to Guesty. Even before that, just from researching and whatnot, learning that in order to scale the business, you have to have systems and automation, automation, automation. So with Guesty, the automation has been incredibly important. So I don’t have to reply to people, check-in instructions, check out instructions, the WiFi stuff. And now actually, I mean I wouldn’t really follow my example if I were anybody else, but I’m just now really getting on top of reports and accounting. I’m very lucky that I’ve been making money and staying afloat and everything that just intuitively, I’m like, okay, I’ll go get one in Marina del Rey because that sounds fun. And it’s all worked out so far, but now I’m just trying to really get down to like the accounting part of it. And how much am I really making per unit? Obviously, I’m covering all my expenses, but I want to be making as much as I can per unit. So seeing in reports and deducting all the expenses. You know where it gets more complex, too. As I’ve been growing is just in the beginning, I was the cleaner, and I was making a lot more money. But obviously, I can’t clean all the units and scale the business, but now it’s like the more you grow, everybody kind of takes a piece of the pie. MT: Did you raise your rates at all or by a small percentage to help you cover those kinds of costs or have you maintained the same rate since you started, for the most part? EK: Great question, and yes. Hopefully, I believe I got it set up correctly. On Guesty, I’m able to adjust the rates per booking channel. So for example, Airbnb takes three percent, and I didn’t include that because I’m just accustomed going to Airbnb rates, but booking.com charges 15 percent for any bookings that come through that. MT: Have you been changing anything with the seasons? Obviously, LA is probably not a good example just because it is so new to you, but as far as Dallas is concerned, did you raise your rates for summer? Are you starting to lower them now that fall is coming? EK: That’s another system that I have. I don’t know what you want to call it, but another app that I’ve integrated is BeyondPricing. Get a FREE MONTH + a $30 credit with BeyondPricing! In the beginning, and I would advise nobody to follow Airbnb’s suggested rates because they’re way off and usually way under. For me, knowing the areas and how nice my places are or whatever, I can kind of guess what the good rate wouldn’t be and Airbnb’s is way low. But BeyondPricing, now that I’ve integrated it, changes and handles all the pricing for all of my units. It has algorithms that like hotels use for rates and seasonality, or if there’s a concert in Dallas that would make it more popular, or weekends or whatever. So I kind of follow what other people have done that are successful companies and hope for the best. So far, it seems to be okay. Based on the advice on their website, I also removed my weekly and monthly discounts, and it seems to be working out well. And another system, by the way, is I’ve also changed things to require a 2-night minimum stay. MT: That’s been a wise decision, you think? EK: Yeah, you know, I did that actually because with MaidThis, I need to be able to give 48 hours advanced notice to 100% confirm a cleaning. And I thought, you know, with that 2-night minimum, I’d always be able to give that advanced notice. Plus, with my housekeeper in Dallas and the people who are now working for her – if you do it all in one night and everyone checks out on Sunday, that’s a lot of cleaning going on… It’s just so tough to do that. I think you just get more quality bookings when you have minimum amounts. MT: As far as feedback goes, do you have a system or foolproof system for getting positive feedback for yourself? Do you tend to leave negative reviews for “bad” guests? EK: I know everyone is concerned with negative reviews, but it all kind of balances out. I have automatic reviews implemented through Guesty so I don’t have to worry about it. Because that’s a big pain to go through for each person. And every once in a while, when a guest is a nightmare – leaving the place super dirty or just was a major thorn in my side or threatening me with bad reviews to try and get a free stay, which is all once in a blue moon – I try to do that before the automation posts its review. But for the most part, I get good reviews. If something happens, I often find myself giving some kind of monetary compensation just to make sure that people don’t get mad or give me a bad review. When you’re renting, there’s so much that’s out of your hands and in the hands of the maintenance department. So, you have to be prepared for that. Thank you, again, Elizabeth, for sharing more about your business! We wish you the best as you continue growing and scaling your business.